Follow these directions and learn how to sew your own easy tote bags. They're a great sewing project for kids, and they also work well for charity sewing projects! Younger kids may not be able to sew a tote bag using a sewing machine on their own, but they can sew the basics. It's also a great way to teach kids to sew. This would also be a fun project for a kids' crafting party. 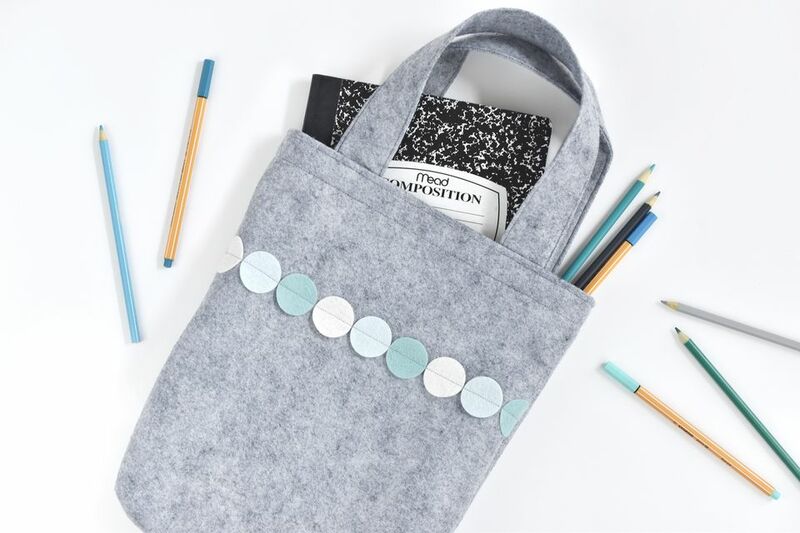 Sew up a tote for each child and then let them decorate the bags with scraps of felt, ribbon, buttons, and more! Search through your craft supplies and use your imagination. The following is what you will need for this tote bag. Note: If you don't have a rotary cutter and cutting mat, or if you want to make this safer for young children to make with little assistance, you can carefully use a pair of scissors. Cut one piece that is 12" x 30"
Cut two pieces that each measure 4" x 18"
All of these sizes are approximate. In fact, once you get the hang of making these easy tote bags, you may want to adjust the size to suit your needs! The easiest way to cut out these pieces is to fold your 18" x 36" piece of fabric or felt in half so it is 18" x 18". Lay it on your cutting mat and cut a 12" x 36" piece. Trim it down to 12" x 30". Next, cut a 4" strip and cut it in half to make two 4" x 18" pieces. There are many ways to decorate a tote bag like this. If you want to attach elements with glue, you should do that at the end of the project. However, if you want to sew decorations on or embellish your bag with embroidery, it's easier to do that before you sew it all together. The sample bag features a line of felt circles, held in place with a single line of stitching. You can add any kinds of sewn decorations that you like. Stitch buttons on the felt, embroider a name or fun design (use tissue paper to mark the pattern), or add some felt or fabric applique. To sew the sides of your tote bag, fold the 12" x 30" piece of felt in half with right sides together. Pin and sew each side, using a 1/4-inch seam allowance. To make a "boxed" bottom that will sit flat, start by folding one bottom corner so the side seam lines up with the bottom folded edge. Lay it flat on your work surface as shown. Use a ruler (a clear ruler is helpful!) and measure up 1-1/2" from the point of the fabric. Draw a line perpendicular to the seam. The line should measure 3" long with 1-1/2" of fabric on either side of the seam. Repeat on the other side of the tote bag. Sew along each marked corner line. ​Lock stitch at the beginning and end of the sewing. Trim the threads and then cut off the points, leaving about 1/4" of fabric. Turn the tote bag right side out. To make the tote bag handles, fold each 4" x 18" piece of felt in half and pin the long edge. Sew each piece with a 1/4" seam allowance. Turn the handles right side out. One way to do this is by attaching a safety pin to one open end and feeding it through the tube until it comes out the other end. Once your tote bag handles are right side out, top stitch up each long side, about 1/8" from each edge. At the top edge of the tote bag, measure in 2" from each seam and make a small mark. Line up the outside edge of one end of the first handle with a marking. Hold the end of the handle so it lines up with the top edge of the tote bag and pin in place. Pin the other end of the handle in place next to the other marking using this same method. Make sure that the handle isn't twisted. Repeat this on the other side of the tote bag for the other handle. Sew around the top edge of the bag with a 1/2" seam allowance to secure the handles in place. To finish your tote bag, fold about 1-1/4" of the top edge of the bag into the tote bag. The handles should now be up and away from the bag. Pin around the top of the bag. Sew around the top edge of the tote bag to hold the fold and the handle ends in place. First, sew about 1/4" from the inside edge of the felt, and then sew about 1/4" down from the folded top edge. Trim the threads and your easy tote bag is ready to go. Now you can add other decorations or start using it right away! 7 Tips for Starting to Sew!